Earlier posts discussed how to cite lexica (here) and dictionaries with more extensive articles on lexical entries (here). The present post shifts the focus slightly to another genre of reference work: topical dictionaries and encyclopedias. Although one might imagine that an encyclopedia is generally more substantive than a dictionary, the use of the terms dictionary and encyclopedia in the titles of these works proves otherwise. Some dictionaries are limited to a single-volume, to be sure, but others stretch across multiple volumes; conversely, some encyclopedias are multivolume, others only one volume in length. Neither do the contents of the two types of works provide a basis for distinguishing them, since both commonly contain both short entries (generally unsigned) and longer articles (usually signed). The point of highlighting this variety is simple: citation style cannot be determined based on the type of work, whether dictionary or encyclopedia; in addition, frequently a single citation style cannot be specified for all the entries or articles in a given work. Unsigned entries are treated differently than signed articles, as are citations from a single-volume work as opposed to those from multivolume works. As with the earlier posts, we begin with principles for referencing entries and articles in these works in a traditional (i.e., footnote; not author-date) citation system, then offer examples of those principles for the most widely used dictionaries and encyclopedias; abbreviations for all the works mentioned in the post appear at the end. 2. When referencing an unsigned entry in a dictionary or encyclopedia, follow the pattern for citing entries in lexica in the earlier post here. 2.1. If the entry is in a single-volume, work, include the abbreviation for the work closed by a comma, the abbreviation s.v. (sub verbo: “under the word”), and the word as listed in the dictionary, enclosed in quotation marks and capitalized according to title case (SBLHS 2 §6.1.3.3). 2.3. As previously, when citing two or more words from a single-volume work, use the abbreviation s.vv. Modify the rest of the citation following example 1 below. Multivolume citations citing two or more volumes should retain s.v. and be formatted as in example 2. 2.4. One should list as the title only the headword, not the additional information often included, such as spelling in the original language, transliteration, or pronunciation. 2.5. Subsequent citations of an unsigned entry are identical to the original citation. In this case there is no shortened reference. In addition, one should not use ibid. for a repeated reference in a subsequent note. 2.6. Neither unsigned entries nor the work in which they appear should be included in a bibliography. A full reference to the work should be provided only in an abbreviations list. 3. Signed entries in dictionaries and encyclopedias largely follow the same citation style as applied to dictionary articles in the post here. 3.1. References to signed articles should include the following elements: article author, article title, abbreviation of reference work, and volume and/or page(s). 46. Gerald L. Mattingly, “Philistines,” HBD, 799. 38. Carol Meyers, “Menorah,” NIDB 4:42. Note the use of a comma after the abbreviation in the citation of a single-volume work; no comma is used with multivolume works. Mattingly, Gerald L. “Philistines.” HBD, 797–800. Meyers, Carol. “Menorah.” NIDB 4:42–43. This guideline departs from SBLHS 2 §6.3.7, which allows subsequent references to “include only the dictionary volume and page numbers.” For consistency, SBL Press now prefers subsequent citations to follow the style of all other articles and essays and to identify the article by title. 51. David G. Burke, “Home,” ISBE 2:748. 51. David G. Burke, “Home,” ISBE 2:748, §IA2. Paul D. Hanson et al., “Apocalypses and Apocalypticism,” ABD 1:279–92. Note that no comma separates the name and et al., that et al. is set roman, and that et al. is closed with a period (because al. is an abbreviation for alii or alia). 15. Adela Yarbro Collins, “Apocalypses and Apocalypticism: Early Christian,” ABD 1:289. Hanson, Paul D., et al. “Apocalypses and Apocalypticism.” ABD 1:279–92. Yarbro Collins, Adela. “Apocalypses and Apocalypticism: Early Christian.” ABD 1:288–82. 5. Signed dictionary and encyclopedia articles are included in the bibliography, but the works themselves are not. Full references to dictionaries and encyclopedias should be provided only in an abbreviations list. The examples below apply the principles above to the most commonly cited dictionaries in the field. Readers with questions about dictionaries not represented are encouraged to email us at sblhs2@sbl-site.org. ABD: This six-volume work contains only a few unsigned articles; most are signed. The former (example 1) should be cited like lexicon entries and omitted from a bibliography; the latter (example 2) are to be treated like any other authored article. ANRW: All articles are signed and should be cited according to the following example. Note the use of a period between the volume and part (33.1) and a colon between part and pages (1:80). For a full discussion of ANRW, see our earlier post here. 76. Graham Anderson, “The pepaideumenosin Action: Sophists and Their Outlook in the Early Empire,” ANRW 33.1:80–208. Anderson, Graham. “The pepaideumenos in Action: Sophists and Their Outlook in the Early Empire.” ANRW 33.1:80–208. DBI: All the articles in this two-volume work are signed and should be cited as any other authored article. 23. Hava Tirosh-Samuelson, “Kabbalah,” DBI 2:5. Tirosh-Samuelson, Hava. “Kabbalah.” DBI 2:1–7. DDD: All the articles in this single-volume work are signed, so they should be cited like other authored articles. Note the comma between the abbreviation and page number(s). 42. Jan Assmann, “Amun,” DDD, 30. Assmann, Jan. “Amun.” DDD, 28–32. DJG: The guidelines and examples shown here for the Dictionary of Jesus and the Gospels apply to all the InterVarsity Press Black Dictionary volumes (e.g., DNTB, DPL, DLNT, DOTHB). All articles are signed and should be cited like other authored articles. 84. Michael O. Wise, “Languages of Palestine,” DJG, 441–43. Wise, Michael O. “Languages of Palestine.” DJG, 434–43. EBR: The Encyclopedia of the Bible and Its Reception is projected to encompass thirty volumes, half of which are slated to be published by the end of 2017. All articles are signed and thus should be cited as authored works. Note also that a number of broad topics comprise multiple subarticles, as in the example below, which focuses on one aspect of the study of Genesis (see also §4 above). 9. Sidnie White Crawford, “Genesis: III. Judaism A. Second Temple and Hellenistic Judaism,” EBR 9:1158. Crawford, Sidnie White. “Genesis: III. Judaism A. Second Temple and Hellenistic Judaism.” EBR 9:1156–60. EDB: This single-volume dictionary includes unsigned entries, which should be cited like lexicon entries and omitted from a bibliography (example 1), and signed entries, which are to be treated like any other authored article (example 2). 26. William G. Dever, “Abel-Beth-Maacah,” EDB, 3. Dever, William G. “Abel-Beth-Maacah.” EDB, 3–4. 40. Michael E. Stone, “Isaac, Testament Of,” EncJud 10:36. Stone, Michael E. “Isaac, Testament Of.” EncJud 10:36. HBD: A single-volume dictionary produced under the direction of the Society of Biblical Literature, the HBD contains both unsigned entries (example 1) and signed articles (example 2). 80. Marilyn M. Schaub, “Holy War,” HBD, 387. Schaub, Marilyn M. “Holy War.” HBD, 387. HWBI: All the articles in this single-volume work are signed and should be cited as any other authored article. 54. Priscilla Pope-Levison, “Truth, Sojouner,” HWBI, 510. Pope-Levison, Priscilla. “Truth, Sojouner.” HWBI, 509–11. IDB: The original four-volume IDB was first supplemented (IDBSup), then replaced by an entirely new edition (NIDB). IDB contains unsigned entries subject to the lexicon citation style for multivolume works (example 1) and signed articles to be cited like any other authored article (example 2). 27. Robert C. Dentan, “Apple of the Eye,” IDB 1:176. Dentan, Robert C. “Apple of the Eye.” IDB 1:176. IDBSup: The entries and articles in this supplement volume follow the same format as IDB. Because this is a single-volume work, the abbreviation is followed by a comma in the second example. 14. David Sperling, “Mount, Mountain,” IDBSup, 608. Sperling, David. “Mount, Mountain.” IDBSup, 608–9. ISBE: The International Standard Bible Encyclopedia was originally published in 1915; the current edition is a revision of that work. Unsigned entries (example 1) should be cited like lexicon entries and omitted from a bibliography; signed entries (example 2) are to be treated like any other authored article. Burke, David G. “Home.” ISBE 2:746–49. JE: Nearly a century old, the Jewish Encyclopedia is still frequently consulted and cited. JE was first published in 1901–1906 by Funk & Wagnalls, then reprinted by Ktav in the 1960s. The work is now in the public domain and may be accessed online at a number of sites (e.g., Archive.org). All articles are signed and thus should be cited by author, title, and publication source. 12. Joseph Jacobs, “Typography,” JE 12:301. Jacobs, Joseph. “Typography.” JE 12:295–335. NEAEHL: This multivolume work includes only signed articles (example 1). Some topics encompass subsections authored by different scholars (example 2), in which case one should separate the main entry and the subsection with a colon. Although the entire work is paginated consecutively, we prefer to cite volume and page number(s). Finally, volume 5 contains articles that supplement some entries in the first four volumes; these supplements should be cited as separate articles (example 3). 51. Abraham Negev, “Petra,” NEAEHL 4:1184. Negev, Abraham. “Petra.” NEAEHL 4:1181–93. 18. Trude Dothan and Imanuel Dunayevsky, “Qasile, Tell: Excavations in Area A,” NEAEHL 4:1205. Dothan, Trude, and Imanuel Dunayevsky. “Qasile, Tell: Excavations in Area A.” NEAEHL 4:1204–7. 43. Ronny Reich and Eli Shukron, “Jerusalem: The Gihon Spring and Eastern Slope of the City of David,” NEAEHL 5:1805–6. Reich, Ronny, and Eli Shukron. “Jerusalem: The Gihon Spring and Eastern Slope of the City of David.” NEAEHL 5:1801–7. NIDB: This multivolume encyclopedia (successor to IDB above) includes both unsigned entries and signed articles. The former are cited by word (example 1), the latter like all other authored articles (example 2). 72. David Graf, “Arab, Arabian, Arabia,” NIDB 1:215. Graf, David. “Arab, Arabian, Arabia.” NIDB 1:212–20. OCD: All articles in this standard reference work are signed, so they should be cited like other authored articles. Note the comma after the abbreviation of this single-volume work. 16. Christopher C. W. Taylor, “Protagoras,” OCD, 1227. Taylor, Christopher C. W. “Protagoras.” OCD, 1227–28. ODCC: All articles in ODCC are signed and to be cited following the pattern of lexicon entries. OEANE: This multivolume encyclopedia includes only signed article and should be cited as illustrated in the example. 17. Wayne T. Pitard, “Aleppo,” OEANE 1:65. Pitard, Wayne T. “Aleppo.” OEANE 1:63–65. PW: Paulys Real-Encyclopädie der classischen Altertumswissenschaft requires its own (future) post. For now one should note the following: (1) PW includes fifty volumes but eighty-four parts, so it is often necessary to cite both the volume and part number, which should be separated by a period; (2) PW includes two distinct series and a number of supplement volumes, each of which must be clearly labeled in citations (more on that later; (3) at a minimum, correct citations of PW articles will include the following: author name (all entries are signed), article title, PW, volume (plus part), and page range (using a colon between volume/part and the page[s]). 56. Ernest Honigmann, “Libanos,” PW 13.1:8–10. Honigmann, Ernest. “Libanos.” PW 13.1:1–11. RlA: The Reallexikon der Assyriologie is planned to include sixteen volumes, fifteen of which are scheduled to be published by the end of 2017. All articles are signed and thus should be referenced by author, title, and source. Although the articles themselves are written in German, English, or French, the headwords are all in German and should be cited in that form. For additional background on RlA, see the blog post here. 42. Raymond Westbrook, “Mitgift,” RlA 8:282. Westbrook, Raymond. “Mitgift.” RlA 8:273–83. RPP: RPP is a translation and adaptation of the fourth edition of Religion in Geschichte und Gegenwart (RGG). All the articles in this fourteen-volume work are signed and should be cited as authored articles. Some articles contain multiple subsections and should be referenced as shown in example 2. 42. Irina Wandrey, “Ascension and Martyrdom of Isaiah,” RPP 1:428. Wandrey, Irina. “Ascension and Martyrdom of Isaiah.” RPP 1:428. 67. Erhard Blum, “Abraham: Old Testament,” RPP 1:12. Blum, Erhard. “Abraham: Old Testament.” RPP 1:11–13. TRE: All the articles in this multivolume work are signed and should be cited as authored articles. As with many other encyclopedias, some broad topics in TRE consist of multiple subsections authored by different scholars. In such cases a colon should separate the headword and the subsection title. 12. Rainer Albertz, “Magie: Altes Testament,” TRE 21:692. Albertz, Rainer. “Magie: Altes Testament.” TRE 21:691–95. N.B. Most of the abbreviations below are based on the title of the work and are thus set italics, just as the title is. PW is formatted roman because it is based on the names of the original (Pauly) and lead revising (Wissowa) editors. Temporini, Hildegard, and Wolfgang Haase, eds. Aufstieg und Niedergang der römischen Welt: Geschichte und Kultur Roms im Spiegel der neueren Forschung. Part 2, Principat. Berlin: de Gruyter, 1972–. Hayes, John, ed. 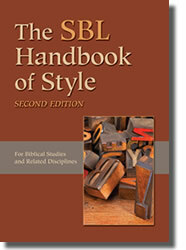 Dictionary of Biblical Interpretation. 2 vols. Nashville: Abingdon, 1999. Toorn, Karel van der, Bob Becking, and Pieter van der Horst, eds. Dictionary of Deities and Demons in the Bible. 2nd ed. Leiden: Brill; Grand Rapids: Eerdmans, 1999. Green, Joel B., and Scot McKnight, eds. Dictionary of Jesus and the Gospels. Downers Grove, IL: InterVarsity Press, 1992. Martin, Ralph P., and Peter H. Davids, eds. Dictionary of the Later New Testament and Its Developments. Downers Grove, IL: InterVarsity Press, 1997. Evans, Craig A., and Stanley E. Porter, eds. Dictionary of New Testament Background. Downers Grove, IL: InterVarsity Press, 2000. Hawthorne, Gerald F., and Ralph P. Martin, eds. Dictionary of Paul and His Letters. Downers Grove, IL: InterVarsity Press, 1993. Klauck, Hans-Josef, et al., eds. Encyclopedia of the Bible and Its Reception. Berlin: de Gruyter, 2009–. Freedman, David Noel, ed. Eerdmans Dictionary of the Bible. Grand Rapids: Eerdmans, 2000. Skolnik, Fred, and Michael Berenbaum, eds. Encyclopedia Judaica. 2nd ed. 22 vols. Detroit: Macmillan Reference USA, 2007. Powell, Mark Allan, et al., eds. HarperCollins Bible Dictionary. 3rd ed. San Francisco: HarperOne, 2011. Taylor, Marion Ann, ed. Handbook of Women Biblical Interpreters. Grand Rapids: Baker Academic, 2012. Buttrick, George A. The Interpreter’s Dictionary of the Bible. 4 vols. New York: Abingdon, 1962. Crim, Keith. Interpreter’s Dictionary of the Bible: Supplementary Volume. Nashville: Abingdon, 1976. Bromiley, Geoffrey W., ed. International Standard Bible Encyclopedia. Rev. ed. 4 vols. Grand Rapids: Eerdmans, 1979–1988. Singer, Isidore, ed. The Jewish Encyclopedia. 12 vols. New York: Funk & Wagnalls, 1901–1906. * The dates listed here correct an error in SBLHS. Stern, Ephraim, ed. The New Encyclopedia of Archaeological Excavations in the Holy Land. 4 vols. Jerusalem: Israel Exploration Society and Carta; New York: Simon & Schuster, 1993. Sakenfeld Katharine Doob, ed. New Interpreter’s Dictionary of the Bible. 5 vols. Nashville: Abingdon, 2006–2009. Hornblower, Simon, and Antony Spawforth, eds. Oxford Classical Dictionary. 4th ed. Oxford: Oxford University Press, 2012. Cross, F. L., and E. A. Livingstone, eds. The Oxford Dictionary of the Christian Church. 3rd ed. Oxford: Oxford University Press, 2005. Meyers, Eric M., ed. The Oxford Encyclopedia of Archaeology in the Near East. 5 vols. New York: Oxford University Press, 1997. Wissowa, Georg, and Wilhelm Kroll, eds. Paulys Real-Encyclopädie der classischen Altertumswissenschaft. 50 vols. in 84 parts. Stuttgart: Metzler and Druckenmüller, 1894–1980. * PW is often abbreviated RE, after the title; SBL Press prefers PW. Betz, Hans Dieter, et al., eds. Religion in Geschichte und Gegenwart. 4th ed. Tübingen: Mohr Siebeck, 1998–2007. Ebeling, Erich, et al., eds. Reallexikon der Assyriologie. Berlin: de Gruyter, 1928–. Betz, Hans Dieter, et al., eds. Religion Past and Present: Encyclopedia of Theology and Religion. 14 vols. Leiden: Brill, 2007–2013. Krause, Gerhard, and Gerhard Müller, eds. Theologische Realenzyklopädie. 36 vols. Berlin: de Gruyter, 1976–2004.